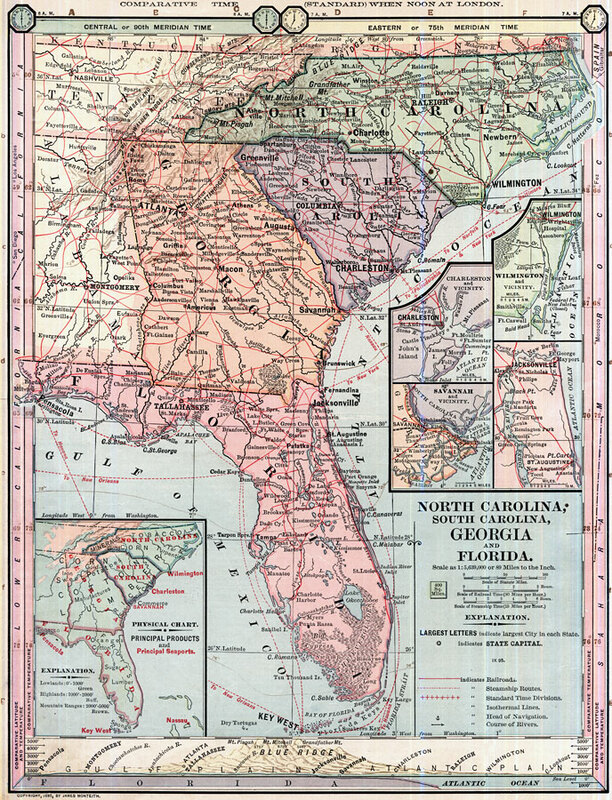 Description: A map of Florida including the Carolinas and Georgia from 1890 showing railroad and steamship routes, major cities, principle seaports, major lakes and rivers, and primary agricultural and industrial products including tobacco, oranges, cotton, sugar, lumber, sponges, and salt. This map includes comparative latitudes and temperatures in the vertical borders, a physical geography chart, an elevation cross section, time zones based on 75th and 90th meridians, and longitude from both Greenwich and Washington. The map scale is 1:5,639,000 or 89 miles to the inch.